A migrant walks in the refugee camp along the border of Greece and Macedonia near the town of Idomeni in Greece on March 18, 2016. 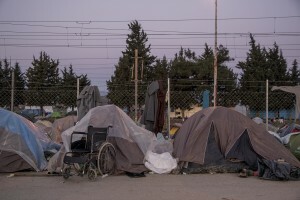 The refugees are being stopped from moving beyond Greece and have been languishing in the rain, mud, and cold with insufficient food and medical care while sleeping in small tents. 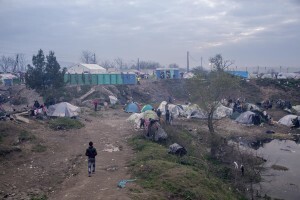 A general view of the makeshift camp near the village of Idomeni at the Greek Macedonian border where thousands of migrants and refugees are stranded in Idomeni, Greece on March 16, 2016. Migrants just arrived at the Idomeni camp at the border of Greece and Macedonia, where thousands of refugees are stranded in Idomeni, Greece on March 18, 2016. 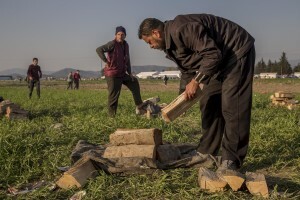 A migrant obtains firewood for the night from a tree at the Idomeni refugee camp on the Greek Macedonian border in Idomeni, Greece on March 18, 2016. Ibrahim Nagiami, 18 years old from Aleppo, Syria is seen on his bed in a tent of the makeshift camp at the Greek-Macedonian border, near the Greek village of Idomeni where thousands of migrants are stranded by the Balkan border blockade in Idomeni, Greece on March 20, 2016. Ibrahim has mental and physical disabilities (probably he has been suffering of spastic tetraparesis) since his birth, but after the outbreak of war in Syria, his condition deteriorated because of continuous bombing, his father says. Migrants walk in a camp along the border of Greece and Macedonia near the town of Idomeni, Greece on March 19, 2016. The refugees are being stopped from moving beyond Greece and have been languishing in the rain, mud, and cold with insufficient food and medical care while sleeping in small tents. 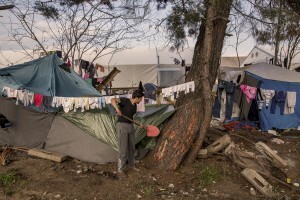 Young migrants obtain firewood for the night from a tree at the Idomeni refugee camp on the Greek Macedonia border in Idomeni, Greece on March 19, 2016. 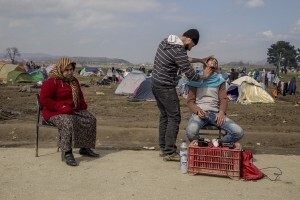 A man get a shave beard at the makeshift camp at the Greek-Macedonian border near the village of Idomeni in Greece on March 20, 2016. 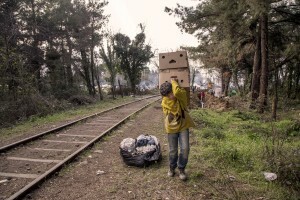 March 18, 2016 – Idomeni, Greece: A refugee child carries boxes containing firewood at the Idomeni refugee camp in Idomeni, Greece on MArch 18, 2016. Refugees’ “journey of hope” towards Western European countries where they dream of having a better life ends in the Balkans following the latest agreement between EU and Turkey. A vest is seen on the barbed wire of the border fence at the Idomeni refugee camp on the Greek Macedonian border in Idomeni, Greece on March 16, 2016. 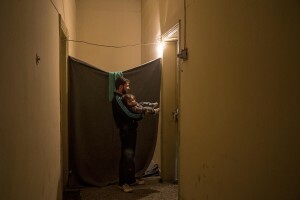 A Syrian man with his daughter in a corridor of the railway station near the Idomeni refugee camp on the Greek Macedonia border in Idomeni, Greece on March 17, 2016. 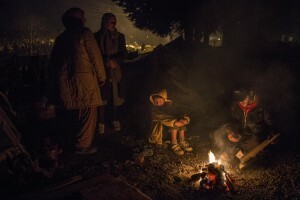 Migrants warm near a fire at refugee camp along the border of Greece and Macedonia near the town of Idomeni in Greece on March 18, 2016. The refugees are being stopped from moving beyond Greece and have been languishing in the rain, mud, and cold with insufficient food and medical care while sleeping in small tents. 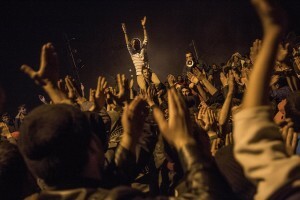 Migrants during a night rally demanding the reopening of the border with Macedonia, in the hopes of making their way to northern Europe in Idomeni, Greece on March 21, 2016. 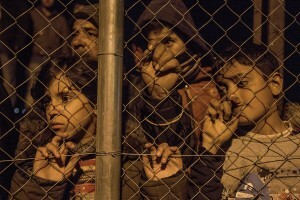 Children during a migrants night rally demanding the reopening of the border with Macedonia, in the hopes of making their way to northern Europe in Idomeni, Greece on March 21, 2016. 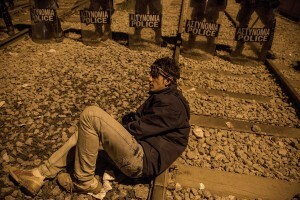 A man sits in front of a line of Greek police in riot gear at the Idomeni camp in Greece on March 21, 2016. The refugees have been demanding the reopening of the border with Macedonia, in the hopes of making their way to northern Europe. 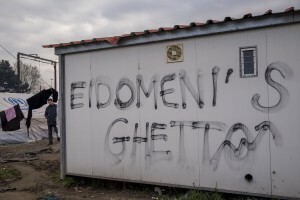 The makeshift camp of Idomeni at the Greek Macedonian border where thousands of migrants and refugees are stranded in Idomeni, Greece on March 20, 2016. 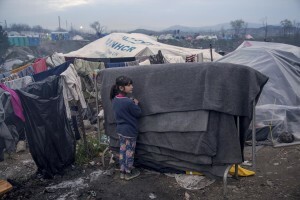 A girl is seen inside the refugee camp along the border of Greece and Macedonia near the town of Idomeni, in Greece on March 17, 2016. The refugees are being stopped from moving beyond Greece and have been languishing in the rain, mud, and cold with insufficient food and medical care while sleeping in small tents. 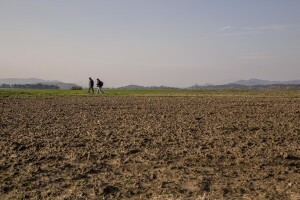 A man walks in the makeshift camp near the village of Idomeni at the Greek Macedonian border where thousands of migrants and refugees are stranded in Idomeni, Greece on March 17, 2016. 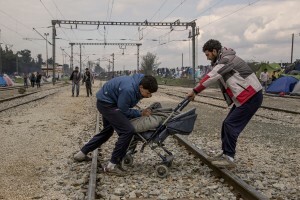 Migrants carry a stroller containing firewood at the Idomeni refugee camp in Idomeni, Greece on March 17, 2016. Refugees’ “journey of hope” towards Western European countries where they dream of having a better life ends in the Balkans following the latest agreement between EU and Turkey. 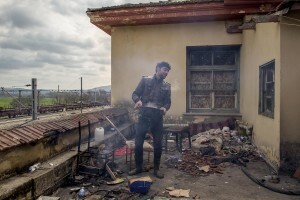 A migrant is seen inside an abandoned house near the makeshift camp of Idomeni at the Greek Macedonian border where thousands of migrants and refugees are stranded in Idomeni, Greece on March 17, 2016. 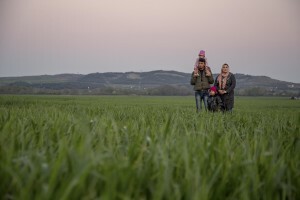 A refugee family stand in a field at a makeshift camp near the village of Idomeni at the Greek-Macedonian border where thousands of migrants are stranded in Idomeni, Greece on March 20, 2016. 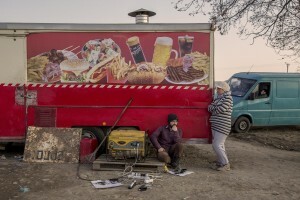 Refugees rest near a catering van at the Idomeni camp near the border of Greece and Macedonia, where they have been stranded in the rain, mud and cold in Idomeni, Greece on March 19, 2016. 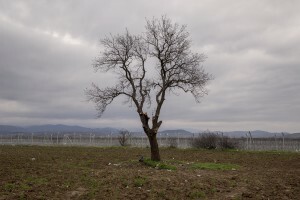 A tree is seen near at the Idomeni refugee camp on the Greek Macedonian border in Idomeni, Greece on March 16, 2016. 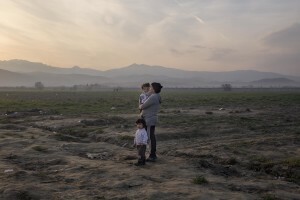 A woman with her daughters at a makeshift camp set by migrants and refugees at the Greek-Macedonian border near the village of Idomeni, in Greece on March 21, 2016. A migrant collects firewood for the night at the Idomeni refugee camp on the Greek Macedonia border in Idomeni, Greece on March 20, 2016. 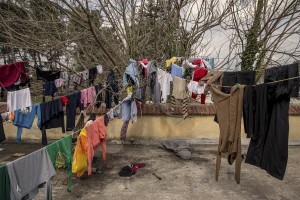 Clothes hanging to dry inside the makeshift camp of Idomeni at the Greek Macedonian border where thousands of migrants and refugees are stranded in Idomeni, Greece on March 17, 2016. 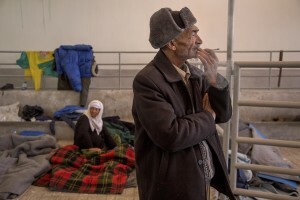 A man and a woman from Iraq are seen in a railway livestock shed where they are camping inside the Idomeni refugee camp on the Greek Macedonia border in Idomeni, Greece on March 20, 2016. 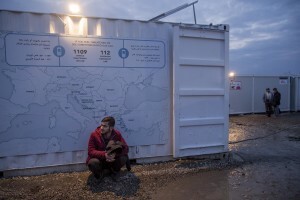 A migrant is seen outside a public bathroom where a map of Europe is posted in the makeshift camp at the Greek-Macedonian border near the village of Idomeni in Greece on March 17, 2016. Refugees’ “journey of hope” towards Western European countries where they dream of having a better life ends in the Balkans following the latest deal between Turkey and EU.